The average NBA fan will look at the Brooklyn Nets record and most likely say that the season was a failure. But I am of the belief that the Nets accomplished something this year that will led to greater success in years to come, and that was the change of culture. That change of culture started when the Nets brought in General Manager Sean Marks from San Antonio. Throughout the year you would hear Marks use a phrase that put in perspective where exactly this team was in terms of contending for the playoffs and that pharse is as follows, "It's the hand we were dealt." A phrase that covers lost draft picks, lack of talent, and much more. Marks brought in 30 new staff members, with about half of those new Nets staffers coming from San Antonio. Those roles include assistant coaches, scouts, pubic relations and analytics staffers all coming from that "Spurs Tree." Marks objective was clear from the jump and that was to re-build the Nets with a San Antonio mentality, a mentality that has led to one of the most historic dynasties in NBA history with five championships in three decades. So after his first full season as the Nets GM, there were a lot of eyes on Marks and a lot of expectations coming from such a well-run organization like the Spurs. His first and probably biggest mistake of the season was the signing of Grievous Vasquez who was brought in to be the backup for Lin but didn’t even make it more than four games into the season before getting cut. This forced the coaching staff to give most of the reps to rookie Isaiah Whitehead at point guard, especially after the hamstring injury that kept Lin on the side lines for a couple months. You can also say the waiving of Yogi Ferrell was a mistake, given the success he had with the Mavericks which earned him a two-year contract. But Yogi simply didn’t fit into the system the Nets were implementing. Yogi was better off in Dallas where the point guard dominates the ball, as opposed to the Nets who play a much freer flowing offense. In his place, Marks signed Spencer Dinwiddie, a player that showed some bright spots as the season progressed and resembled a younger version of Shaun Livingston. It took some time but by season's end there wasn’t a person within the organization who didn’t think he improved. Now let's look at the good, as over the course of the season, Marks picked up three players via a 10-day contract (Spencer Dinwiddie, Quincy Acy, and Archie Goodwin) and then signed them to multi-year deals following their second 10 day contracts. They all played well down the stretch and have tremendous upside and youth, with the exception of Acy being the only one over 23 years of age in the group. Now lets visit Marks' first offical trade made as the Nets GM. Marks sent soon-to-be free agent Bojan Bogdanovic to Washington, and in return, received Washington's first-rounder in this year's draft and Andrew Nicholoson. That now gives the Nets three draft picks in a loaded draft when they started the year with nothing. He also traded 'cash considerations' (just about $75,000), for K.J. McDaniels, a versatile wing from Houston who also has tremendous upside. Brooklyn needed athleticism in the worst way and Marks found a young guy that can help patch that up in McDaniels. He averaged six points in 14 minutes since the Nets signed him and became a vital part of the bench during a successful second half for the second unit. All of these actions by Marks fall under the culture change he is incorporating in Brooklyn. Marks often talks about finding “high character guys” for his system but what the front office did was encourage that character. It was a vibe that you rarely see in the NBA. The Nets allowed players’ families on the planes and on team trips, which is unheard of in the NBA. Marks even found a storage room off the practice court at Barclays and turned it into a family room. He assigned his executive assistant and the basketball operation H.R. director to work with wives and girlfriends to ensure they were as comfortable as possible during a game or practice. The impact? Good energy; empathy and understanding; cohesiveness: All key elements to changing a culture. I wonder who Marks got that from? I have a hint, it rhymes with Top…In case that went over your head, I mean the guru of incorporating a winning culture: five time champion Greg Popovich, the mentor to Nets GM Sean Marks. Getting back to the court now, it didn’t take long for things to go south for the Nets, as a hamstring injury suffered in early November initially kept Jeremy Lin out for 17 games, in which the Nets went 4-13. Lin returned for seven games but would re-aggravate the hammy in a buzzer beater win for the Nets on December 26th against the Hornets. The Nets were 7-23 at the time and in no rush to bring back Lin at that time. From December 26th through the All-Star break, the Nets went 1-27 and it got real ugly. The questions started flowing in on when Lin would return and the severity of the injury. During that 1-27 stretch, the Nets lost 16 games in a row and went the entire month of Febuary without a win. But one of the very few bright spots for this Nets club was the play of rookie Caris LeVert. He started to break the rotation around early December and right from the start, head coach Kenny Atkinson realized that this kid had tremendous versatility on both sides of the ball. A key component for LeVert throughout the season was being able to withstand the grueling schedule of a professional athlete since he struggled to stay on the court at Michigan. But that wasn’t an issue for LeVert as he stayed healthy and produced throughout the season and should earn himself serious consideration for an All-NBA Rookie team. Although the Nets were struggling immensely, the fans stayed loyal and positive and the team kept working hard regardless of their record. The Nets went on and finished out the season on an extremly impressive note once they got their leader back. Lin returned right after All-Star break and the Nets finished 11-13 from March through the end of the year. They had been 9-49 prior. The record in March and April may not count for much but with a team that struggled the way it did throughout the year, this was huge for the Nets and they proved they were a respectable team with both Lin and Brook Lopez in the lineup. Speaking of Brook Lopez, in the second to last game of the year in Boston, Lopez became the all-time leading scorer for a Nets Franchise that has had nine Hall of Famers, including legends Doctor J and Rick Barry. A tremendous accomplishment and it couldn’t have happened to a nicer person. 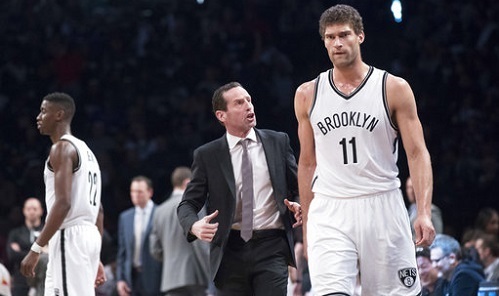 Through all the ups and downs in his time with the Nets, Lopez remained as good a guy as you’ll find in the NBA. Brook has no intentions of leaving despite the trade rumors that surrounded the center over the past couple of seasons, and if the Nets are serious about winning then Lopez is going nowhere. This is no quick solution for this situation and it will be a year or two until you can legitimately say this team is a contender for the postseason. So if patience isn’t your thing, then the Nets aren’t the team for you. With that said, there have been worse days in the Nets organization, and I would be extremely confident with the influx of new staff members brought in by Sean Marks and prepare for a brighter future.